New item in original packaging. 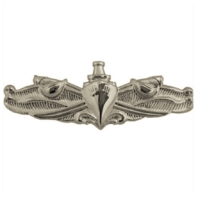 Navy Badge: Surface Warfare Enlisted - regulation size, mirror finish. Also known as ESWS is authorized for wear by any enlisted member of the United States Navy who is permanently stationed aboard a navy afloat command and completes the Enlisted Surface Warfare qualification program and personal qualification standards. The Enlisted Surface Warfare Specialist Badge can be obtained at any time after reporting to a ship for E-5 and above. Individually priced.